We know a lot of organizations are just plain stuck in the past: they know their employees are bored stiff with the same old training programs; they know they aren’t engaged; and they know that even though they’re spending big bucks on corporate learning, the information isn’t sticking and they aren’t getting the return on their investment. You might say, “Well, if they know all this, then why aren’t they doing anything about it?” That’s a fair question. But, if you think about it, it’s hard to make a change when you don’t know where to start. There are tons of great resources that talk about the benefits of modernizing corporate learning, but they don’t really explain how to make it happen. So, we’ve put together a new guide to help with the transition. 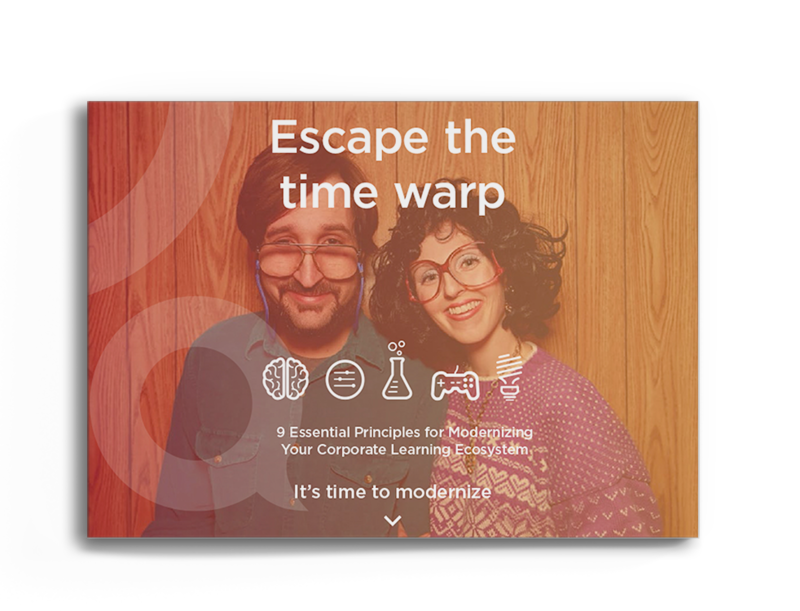 We won’t go into detail in this post, but download our free eBook—Escape the Time Warp: 9 Essential Principles for Modernizing Your Corporate Learning Ecosystem—and you’ll learn what each of these principles entail, plus get practical ideas for implementing them. So, no more excuses. It’s time to modernize!